Volunteering is good for the soul and what better time to get involved than during National Volunteer Week on April 7-13! Volunteering and giving back to our community is important to the storage unit experts at Hollywood Storage Center of Thousand Oaks. It’s one of the reasons we implemented our Water Donation Program for local non-profit organizations. If you’re looking for some ways you can give back this year, our team has some ideas for you! Senior Concerns – Make a difference in the lives of our senior citizens. Senior Concerns provides vital programs and services to the elderly and has lots of volunteer opportunities. Mountains Recreation & Conservation Authority (MRCA) – If you love the outdoors, these volunteer opportunities are just right for you. MRCA is dedicated to the preservation and management of local open space and parkland, wildlife habitat, watershed lands and trails in both wilderness and urban settings. Teen Activities Council – If your high schooler is looking for community service hours or just wants an outlet to volunteer and meet other teens, the City of Calabasas offers local teenagers an opportunity to make a difference in their community. Volunteers on Patrol (VOP) – The City of Agoura Hills offers an interesting volunteer opportunity for people interested in dabbling in law enforcement. VOP volunteers patrol for duties such as searching for missing children, conducting school safety checks and assisting the Sheriff’s Training Academy. Thousand Oaks Libraries – Hundreds of volunteers give their time every month to make our libraries the best they can be. Check out the volunteer duties and apply to become a volunteer. Join a Service Club – To keep the fun going year-long, consider joining a service club near you. Choose from American Legion, Assistance League of Conejo Valley, Lion’s Club, Masonic Lodge, Kiwanis Club and many others. 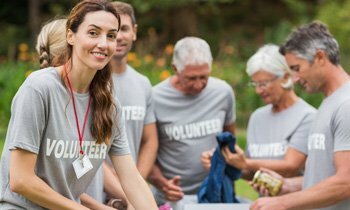 Not only does volunteering feel good, it keeps you active, which is good for your health! Want some other ideas for staying active in the Conejo Valley? Check out this article on Tips to Stay Active. And, as always, when it comes to providing additional storage unit space to keep you organized and clutter free, we’re here to help. This entry was posted in Hollywood Storage Center, Things to do near Thousand Oaks, Thousand Oaks Storage and tagged Agoura Hills, Calabasas, Conejo Valley, Hollywood Storage Center, national volunteer week, Thousand Oaks, volunteering by Hollywood Storage Center. Bookmark the permalink.